HOMESTEAD, FL – On Sunday, December 14, 2014, over 450 guests gathered at Gulfstream Park Racing and Casino for “A Day at the Races,” South Florida SPCA’s (SFSPCA) annual fundraiser. After expenses, $64,000 was raised for the benefit of rescued horses and animals at SFSPCA’s facility in Homestead, Florida. Further, $2,500 from race sponsorship proceeds was donated by SFSPCA to the Permanently Disabled Jockeys Fund (PDJF). 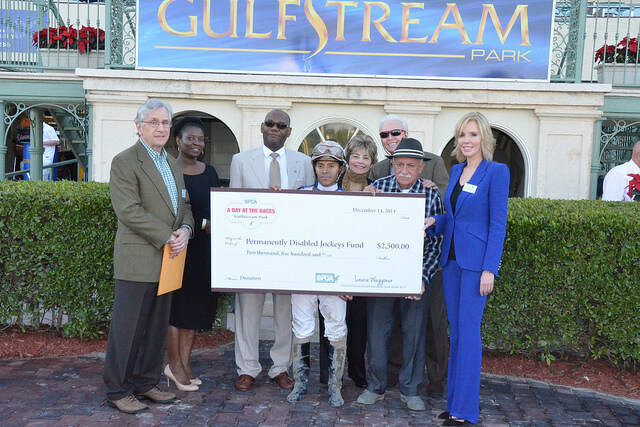 SFSPCA board member Alvin B. Davis (far left) and event chair Kathleen Monahan (far right) in the Winner’s Circle presenting $2,500 from race sponsorship proceeds to PDJF. A “Horses and Holidays” theme made A Day at the Races even more festive for guests, who enjoyed a lavish buffet luncheon in a private area of Gulfstream’s signature restaurant Ten Palms and an exciting afternoon of horse racing. Event sponsors viewed the action on the track from Ten Palms’s exclusive, air-conditioned vantage point, while race sponsors watched from the Winner’s Circle and were photographed with the winning jockeys. A silent auction featuring trips, excursions, jewelry, sports memorabilia, designer bags, accessories, art and more, along with raffle prizes, added to the fun. 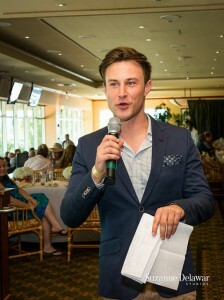 WSVN-7 reporter Kevin Ozebek, who became aware of SFSPCA’s work when covering the dramatic rescue of eight horses last summer, did an excellent job serving as the event emcee. Several of Ozebek’s WSVN-7 colleagues attended, including reporters Nicole Linsalata, Brandon Beyer, and writer/producer Kim Segal. Victoria McCullough, who was not in attendance, was awarded the inaugural South Florida SPCA Horse Rescue Award for Excellence in Equine Protection by SFSPCA founder and director of ranch operations Laurie Waggoner, for McCullough’s extraordinary efforts to protect U.S. equines from slaughter and abuse. Additionally, Florida Congressman Mario Diaz Balart was in attendance and acknowledged Miami Dade State Attorney Katherine Fernandez Rundle for her support of equine welfare issues. Rundle, in turn, recognized Laurie Waggoner’s service to the county since founding SFSPCA in 1992. If you would like more information about South Florida SPCA’s A Day at the Races, please contact event chair Kathleen Monahan at 786- 351-2632‬ or kathleenm@12thwardproductions.com. To view the entire event photo gallery, CLICK HERE, or scroll to the bottom of the page for the event slide show. 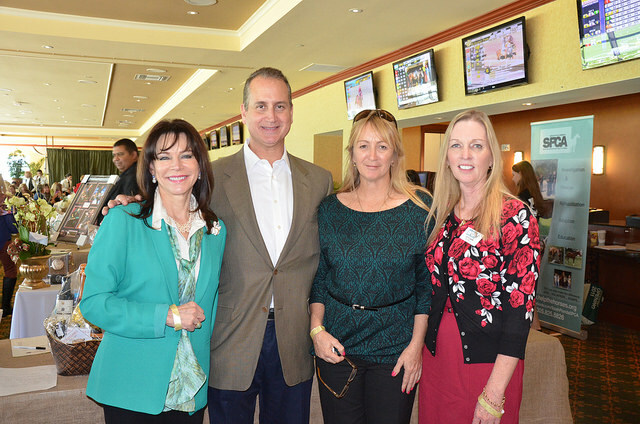 Miami Dade State Attorney Katherine Fernandez Rundle, Florida Congressman Mario Diaz Balart, South Florida SPCA Founder Laurie Waggoner and SFSPCA board member Joy Carr. It was a picture perfect day at Gulfstream Park for SFSPCA’s annual A Day at the Races fundraiser.